For Russian Orthodox Christians, Easter – the major feast of the year – is a long and powerful tradition. This year, April 24 is the day when the Christian world is celebrating the resurrection of Jesus Christ after his crucifixion. ­Father Georgy Roshchin has taken RT through the festive ceremony from the Cathedral of Christ the Savior. On Saturday evening, a plane carrying a lamp with a flame of Holy Fire from Jerusalem landed in Moscow’s Vnukovo airport, where believers and Russian Orthodox Church clergy officials had gathered to see its arrival. The delegation immediately lit a lamp, which was then taken to Moscow's Cathedral of Christ the Savior, where Patriarch Kirill was leading an overnight Easter service. The Holy Fire was also shared among the representatives of the Russian Orthodox Church to make a tour of prayers in all regions of the country. The Holy Fire is believed to have been appearing by miracle in the Holy Sepulchre in Jerusalem on the eve of Orthodox Easter for more than 1,500 years. The main Easter service in Russia was held according to tradition in the Cathedral of Christ the Savior in Moscow, the country’s main cathedral, starting on Saturday night and finishing early on Sunday morning. The Service was led by Patriarch Kirill of Moscow and All Russia, who heads the Russian Orthodox Church. Over 5,000 worshippers gathered in the country's major cathedral this year. The vigil was attended by Russia’s highest officials, including President Dmitry Medvedev and Prime Minister Vladimir Putin. Easter is a so-called moveable feast; it does not fall on a fixed date in the Gregorian or Julian calendars. Instead, the date for Easter is determined by a lunar calendar. While the Easter holiday usually comes earlier for those living in the West, this year both Christians in the East and in the West will enjoy the festivities on April 24. 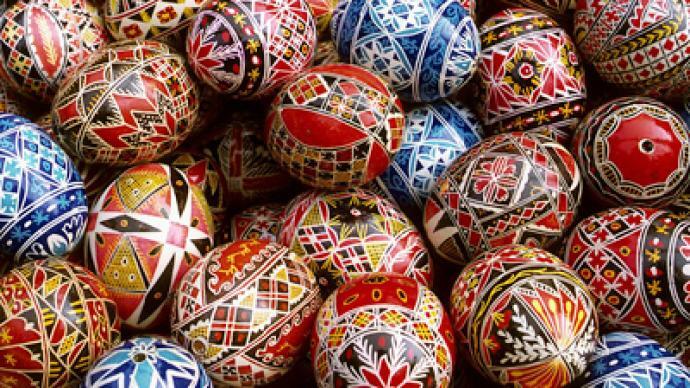 On this day it is traditional to bake special Easter cakes (kulich) and a curd spread (paskha, a dish which bears the original name of the holiday in Russian) and painted eggs (krashenki). Russians celebrate Easter in a very special way. The congregation gathers in the church or cathedral and takes part in an Easter vigil commemorating the buried Christ. Orthodox churches in Russia have an inner sanctuary away from the reach of worshipers and only accessible by priests. At Easter, the door remains closed until the stroke of midnight, when the priest opens it and approaches the altar holding a crucifix and candles saying: "Christ is risen! Christ is risen! Christ is risen!" After hours of silent anticipation, the worshippers reply: “He is risen indeed!" Solemnly singing, they walk through the church and then outside and around it. Everyone lights candles and follows the procession. The Orthodox liturgical chant is used instead of an organ. The Service goes on until dawn when the priests walk around the crucifix. Numerous church bells ring and finally the priests tell everybody to forgive each other and seal it with a hug and a kiss. For the Orthodox Church this holiday also signifies the end of the seven weeks of Lent. Orthodox believers do not eat animal products, such as meat and milk; fish is allowed twice during Lent and total refusal of food is welcomed on some days.